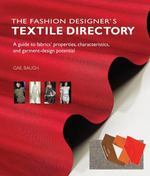 The Fashion Designer's Textile Directory 1 Edition This valuable materials directory for professional dressmakers and fashion designers is also a good reference source for students of fashion design, as well as for those who make their own garments. The author points out the best fabrics for creating specific garments, explaining how each fabric's qualities make it suitable for various items of apparel. Knowing which fabrics can support a structured silhouette is fundamental to fashion design, and this book explains the use of stiff or crisply textured fabrics for tailored garments, as well as soft textured fabrics for rounded forms. Ornamentation is also discussed, and includes advice on how to work with different fabrics to create what author Gail Baugh classifies as opulent, simple, and in-between decorative effects. The book's additional features include:Fiber characteristics chartsWeave charts and knit charts with fabric names and photosA glossary of terms and definitionsLists of textile suppliers, online stores, and study resourcesThis directory of textiles and their uses is profusely illustrated with more than 500 color photos.